Want an attractive and colourful floral display in your home? 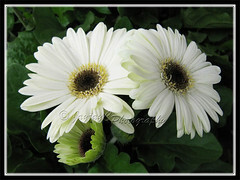 Choose the Gerber Daisies that will surely lend beauty and brightness, inside the home or out in the garden. They’re such a cheerful and vibrant lot and you’ll be spoilt for choice of floral colours that come in an extensive array of dazzling colours. Truly kaleidoscopic and explosive in nature! 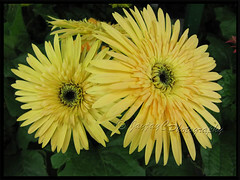 Barberton Daisies are an on-and-off attraction in our garden. Since they’re reasonably priced, we buy them on impulse whenever their spectacular and brightly-coloured blooms shout for attention during our nursery visits or at the superstores. The potted plants are value for money, lasting longer than the cut flowers, and fabulous for a temporary display at home, lasting probably between 4-6 weeks. When plants are finished flowering, they can be transplanted into flowers beds outdoors and may even last for several months or a few years with proper care, being mindful that the indoor plants should first be introduced to direct sunlight gradually. 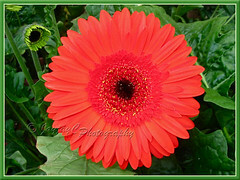 Etymology: The genus Gerbera was named after Traugott Gerber, the 18th-century German naturalist. And, the species named after its founder, Robert Jameson, a Scotsman who rediscovered it in 1884 near Barberton in South Africa, thus attributing to the common names, Barberton Daisy and African Daisy. Origin: Native to the Transvaal and Cape Province of South Africa. 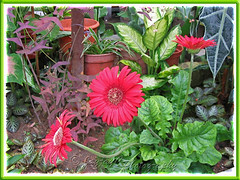 Features: Gerbera jamesonii belongs to the genus Gerbera that has approximately 30 species in the wild, ranging from South America, Africa, Madagascar and tropical Asia. A highly versatile species that has been extensively hybridized over the decades and presently has several hundred varieties and hybrids. An evergreen herbaceous perennial in the tropics and an annual in colder climes, it has a low-mounding and clump-forming habit with variable height. Depending on the hybrids and varieties, it varies between 20-60 cm tall and spread almost as wide, with a rather moderate-growing rate. Petioled leaves in deep green emerge from the crown in basal rosettes with coarse and oblong-shaped blades that are deeply lobed, measuring between 20-25 cm in length and half in width. A single brilliantly-coloured flower is produced and held terminally on each flowering scape, typically up to 45 cm tall, that sprouts from the ground and towers above the green foliage in lovely contrast. It is covered with extremely fine hairs and fuzzy to the touch. Green sepals that connect the stalk to the back of the flower are similarly matted with fine whitish hairs. 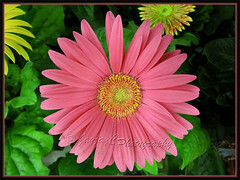 The flower-head structure of the Gerber Daisy is easily distinguishable, comprising of hundreds of individual flowers, but collectively appearing as a single flower. 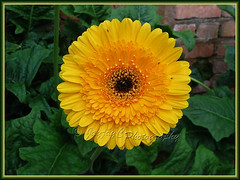 It possess composite flowers with 3 flower types, that is, the central disk contains the disk florets, then surrounded by a ring of intermediate trans florets and the outermost petals constitute the final ring(s) of ray florets. The colourful rays and its central disk may be of almost similar or contrasting shade. Its reproductive system is located in the disk florets (female) and trans florets (male). 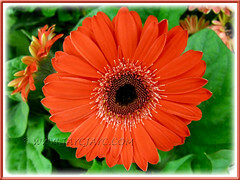 The Gerbera Daisy flowers are impressively large, 10-12.7 cm diameter, roundish and come in an awesome array of diverse colours that have evolved over decades of hybridizing. Commonly seen are the red and crimson to pink, cream and yellow to deep orange in various hues and less frequently the whites and violet, but never blue (?). Blooms can be in single or double forms, and even with serrated or frilly petals, of differing width and length, and mottled or variegated too. Amazing! 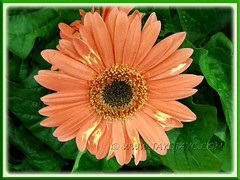 No wonder, Gerber/African Daisies are highly sought by florists and gardeners alike! 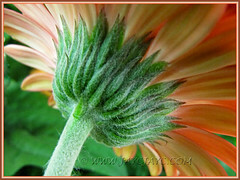 Culture (Care): An easy-to-culture plant, Gerbera jamesonii needs minimal attention. Moisture: Average water needs. Do not overwater as overly wet or soggy conditions can cause crown rot. Avoid overhead watering as it’s susceptible to powdery mildew and best to water it early in the day. Indoor plants may need misting on leaves but not on the blooms. Soil: Prefers a sandy or loam medium that is humus or organic-enriched and must be well-drained. 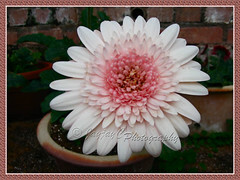 Others: Do not plant Gerber Daisy too deeply or kept too wet as susceptible to crown rot. Feed once monthly with a balanced fertilizer during active growth and flowering. Remove spent flowers and stems, as well as withered or scorched leaves. Watch out for pests like aphids and whitefly. 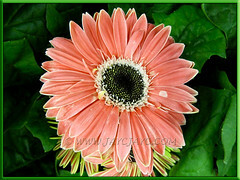 Gerbera Daisy is susceptible to several diseases, such as powdery mildew, grey mildew and black root rot. For subtropical and temperate regions: Hardiness: USDA Zone 9-11, it is grown a perennial but elsewhere, an annual. It can tolerate some frost but not freezing temperatures that will kill plants to the roots. Best to grow in containers in non-hardy regions to overwinter plants indoors easily. Nevertheless, Zone 8 gardeners have succeeded in growing them as perennials if properly mulched and sheltered from freezing winds. Water sparingly in winter and reduce feeding to once every two months. To propagate, divide the clumps and repot them in spring. They’ll flower throughout the year if grown in the greenhouse. Propagation: By division of clumps, which is the quicker, easier and better alternative to propagating by seeds where plants generally do not come true in form and colour. If by seeds, they should germinate between two to three weeks, otherwise not viable if longer than that. 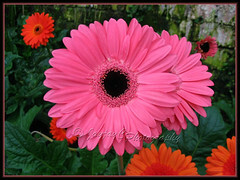 Usage: Gerbera jamesonii make ideal ornamental groundcovers in garden beds and borders or as edging and in landscaping. Excellent flowering plant in containers to decorate and brighten homes or indoors, window sills, patios and decks. 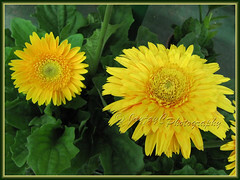 Can be grown in greenhouses for year-round flowering. 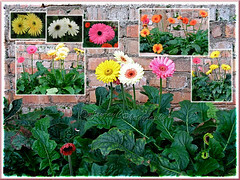 Even as lovely in mixed planters with Gerbera Daisies of other shade or join a crowd of other plants with complementary colours. Plant them in your garden to attract bees, butterflies and birds. 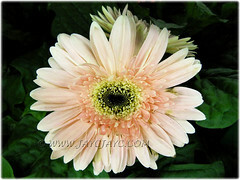 You can use Gerbera jamesonii to purify or cleanse the air. In the NASA Clean Air Study, this plant was proven effective in remove benzene, formaldehyde and trichloroethylene. Check the list of air filtering plants at Wikipedia. 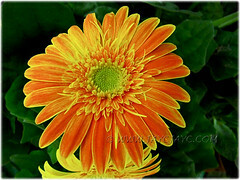 With a vase-life of about 2 weeks, they’re widely and popularly used as cut flowers for floral arrangement, indoor decor, gifts for special occasions, wedding bouquets and the like. It is ranked as the fifth most popularly used cut flower worldwide and hence an important commodity. Also, it is widely used as a model organism when studying flower formation. 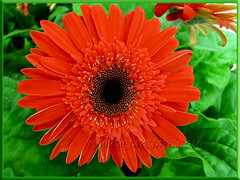 Microscopy of Gerbera Daisy by Brian Johnston, and another by Brittany Richardson, a must visit to enjoy its beauty! 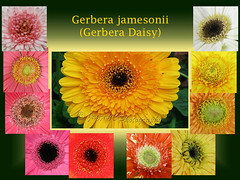 More Gerbera jamesonii (Barberton/Gerber/Transvaal Daisy) pictures to enjoy! 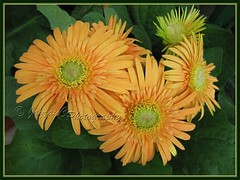 These gerbera daisies are really lovely. I am always tempted to buy them whenever I see them displayed at the garden centres. I never tire of watching the blooms. Now, I am tempted again to get some. You have a great collection of pictures here. I noticed my neighbour bought this plant and it was doing well for few months giving out flowers once awhile. After that, the whole thing died -dried up. I really wonder whether they have a short lifespan. Can they really live in our climate? 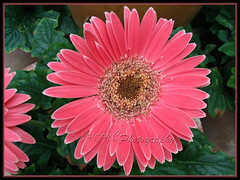 I’m pretty convinced that Gerbera Daisies can thrive well in our tropical climate, James. Whether it is short-lived as an annual or long-lived (lasting a couple of years), depends on the care it gets. Like your neighbour, we too have experienced many failed attempts, but hoping for future successes now that we know more of its correct culture. They’re simply irresistible! Great article! Please contact me if you would like to discuss contributing to our site. Here in Barberton, South Africa, they grow in the wild (they actually originate here) and it is 9 months very hot – and dry – they wilt, look dead, but will come back – either by giving them little water or the rains. I would certainly not remove them – water them or wait for the rain – they are very strong plants, surviving the barren climate here for years. Thanks for your kind words and invitation, Jacques! 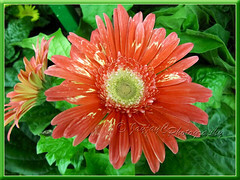 Appreciate too your helpful pointers on gerbera’s culture. Let me know if you’re interested in publishing/sharing content. Lovely! I’m in zone 9 and have had these come back year after year (8+) with very little attention. Reliable! How wonderful for you, Kim! Thanks for sharing.